Pendulums bring to light both positive and negative intentions and enhance your clarity on subject matters close to your heart. 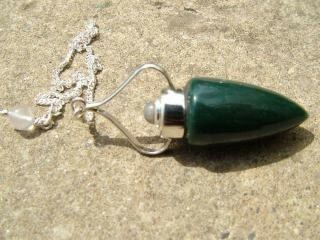 A pendulum will act as a powerful guide to those seeking a positive direction for the next steps in life's choices. Pendulums are used for divination. They are very accurate when used correctly. Be clear to state a precise question which can only have a 'yes', 'no' or 'neutral' response. It will swing in either vertical or horizontal lines, or have a circular motion. Try asking it 'test' questions in your head to see which kind of motion response it will give for each correct 'yes', 'no' or 'neutral' answer. 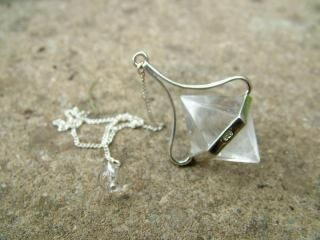 Black Tourmaline Standard-Drop (standard chain length) Pendulum Pendulums are used for divination..